It got cold here again in Texas. At least for today. Who knows? Tomorrow may be all sunshine and short sleeves again. But today is overcast and back to sweaters. I even have a fire going with the last of the wood in the fireplace. It feels cozy. All that’s missing is some Irish Coffee. It is morning as I write this, so perhaps Irish Coffee wouldn’t be the most prudent idea. Though, as they say, it’s 5:00 somewhere! Alas, for now I will dream of it’s comforting wiles, the warmth which comes from both the heat and a generous shot of Irish whiskey. For I am, after all, a whiskey gal. And Irish whiskey is some of the best to be had…and I’ve had plenty! My first trip to Ireland was back in July 2011. It was magical. A week in the lush greenness that is this beautiful country was all it took for me to fall in love. To embrace my Irish [by marriage] heritage. I had been traveling with my family, and we were on the final week of a five-week Europe vacation. One of our first stops in Ireland was to the Jameson Distillery in Middleton. It was here that I had my first “proper” Irish Coffee. Not only did I drink one – or even two perhaps, I also learned how to make one [properly of course]. Oh, sure, it looks easy. Just add a bit of whiskey to some hot coffee and top it off with some whipped cream, right? Hah! While that may be tasty, there are a few refined techniques which will greatly improve the experience. Part of the goal is to have the cream stay with the coffee as it is drunk. Meaning, it doesn’t get mixed into the coffee, yet you also don’t drink it off the top within the first few sips. That would leave your coffee exposed to get cold, and who wants that? No, done properly, each taste should have a bit of cold whipped cream paired with hot coffee. A nice yin/yang effect. Dark vs. Light. Hot vs. Cold. Smooth vs. Creamy. Delicious. It should be obvious to begin with good coffee. Now I am not going to judge and tell you to use a certain coffee. I’ll just recommend using your favorite; something you love. This is the base of the drink after all. And with so few ingredients it’s important to use the best ones you can find. My preferences tend to be a stronger brew. We are currently using a locally roasted Brazilian espresso bean. It has chocolatey notes, adding to the depth of flavor. At Jameson’s they used a French press to make the coffee. I do love French press coffee, but I enjoy the coffee from our machine just as much. And it’s faster. So that’s what I use. Again, no judgement from me on your favorite way to brew or drink your coffee. Go with what works for you; just make it tasty. Obviously, the whiskey used at the distillery was Jameson’s. But if you have a personal preference for another brand, use that. It does not need to be a super premium whiskey; however, I don’t like to go too cheap here either. As I said before, there are only a few ingredients. Make them count. My preference is Jameson’s for this. I have also used Bushmill’s and Tullamore Dew. All were good. Great even. Brown sugar was used in Jameson’s demo. It gives a bit of depth to the drink. You can use light or dark brown sugars. Have I mentioned “preference”? Raw sugar can also be used. Or in a pinch [gasp] plain white sugar works. Experiment. Come on, it’s only a drink. Try it different ways and see which way works best for you. There are no mistakes here. Only subtle taste nuances. Go for it! I do recommend dissolving the sugar in either some of the hot coffee or the whisky ahead of time to help it mix in better. Now for the tricky part. The cream. First, make sure you are using heavy whipping cream. If you can find low pasteurized, or even no-pasteurized, that is ideal. It whips better. But if not, go for what you can find. At the distillery they shook the cream in a cocktail shaker. If you prefer you can use a whisk or, if you are careful, a hand mixer. The important thing to remember is to not over whip the cream. Let me repeat that: DO NOT OVER WHIP THE CREAM! Here’s why: if you whip it too much it is going to just sit on top. You will not get that perfect integration with the coffee when sipping. Likewise, if you under whip the cream it will not float on top at all and will instead mix right into the coffee. What you want is something somewhere in between. Thick enough to stay suspended on top of the coffee, thin enough that you are able to get a little bit with each sip of the coffee below. Hot coffee coming through cold cream…a sensory delight! As I mentioned, there are only a few ingredients: your favorite coffee, Irish whiskey, brown sugar and heavy whipping cream. That’s it. Four items. I always have at least three of those items on hand at all times, heavy whipping cream being the exception. The proper vessel is important and should be warmed up ahead of time by filling it with hot water. It doesn’t need to be a designated Irish Coffee mug (though that looks nice) but it must be able to hold a hot drink. 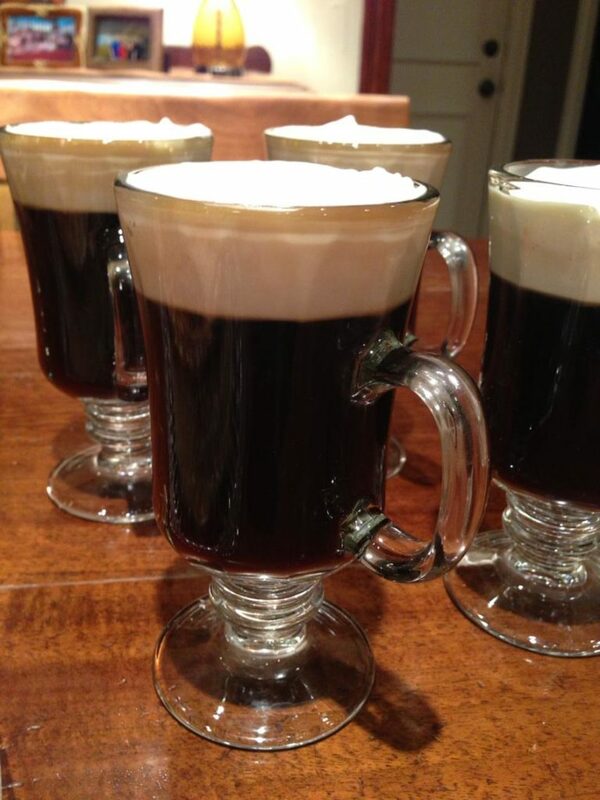 I do have a set of Irish Coffee mugs just for the occasion. Rather than describe how to make a proper Irish Coffee, I came across a video from Jamie Oliver’s DrinksTube which does the job for me. Not only does it show you the process and walk you through it step-by-step, there is a bit of history behind the drink offered as well.